Chain restaurants used to be places of identikit design, with furniture, colour palettes and materials for interiors that were often bland and charmless and jarred with the architecture of the buildings they inhabited. But things have changed, and in an increasingly competitive high-street design has become a powerful weapon for retail chains and independent businesses alike to weald. 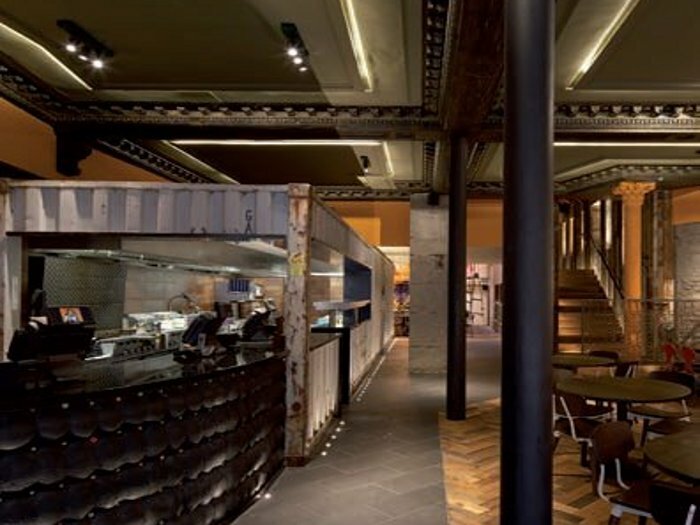 Nando's, the Portuguese-style chicken restaurant chain has long been ahead of the curve when it comes to the design of its restaurants, often producing award-winning schemes including a branch in Spinningfields, Manchester, which won an FX Award in 2010 for Best Restaurant and Bar. One of the chain's latest outposts, in Dundee, is a case in point. Designed by BuckleyGrayYeoman, also behind the Spinningfields branch, the interior uses wood recycled from Balinese huts, original artwork and a 12m-long shipping container. In this case, design inspiration came not only from the 'Nando's DNA', but also from the natural character of the space itself, which comprises two cojoined historic buildings, - a Grade II listed Victorian building at the front with a larger Twenties warehouse building behind. The space had been occupied by a pizza chain and looked, says Thrush, 'very dated, with no natural light and low suspended ceilings', but below this tired interior lay hidden gems. Removing the suspended ceilings from the front of the building, Thrush and his team uncovered original Victorian features including Corinthian plaster ceilings. He and his team went on to remove the existing modern shop front and replace it with a recreation of the Victorian one they had see in old photographs. Uncovering and reinstating the Victorian character of the front portion of the building went down well with Dundee's conservation officers, but this also led to a conundrum for the designers: how to make the restaurant feel like a coherent space when the characters of the front and rear sections were so different. Rather than trying to make the two sections fit in with each other, the designers accentuated the buildings' natural characters. They removed a plant room to create a capacious double-height space with an exposed timber roof and structural steelwork, while new large-scale parquet flooring further accentuates the space's scale. Thrush wanted to keep the 6m ceiling height and used bespoke chandeliers which he designed himself and which are made of modular elements that slot together to make this space feel more intimate. Beyond the restoration of the Victorian shop front and exposing original details, Thrush and his team then proposed a more controversial design feature: a shipping container to house the kitchen and serving area. Running between the two sections of the building,it creates a visual link between the two design styles. Rather than using a new container, Thrush and his team procured one that had 'reached the end of its life'. 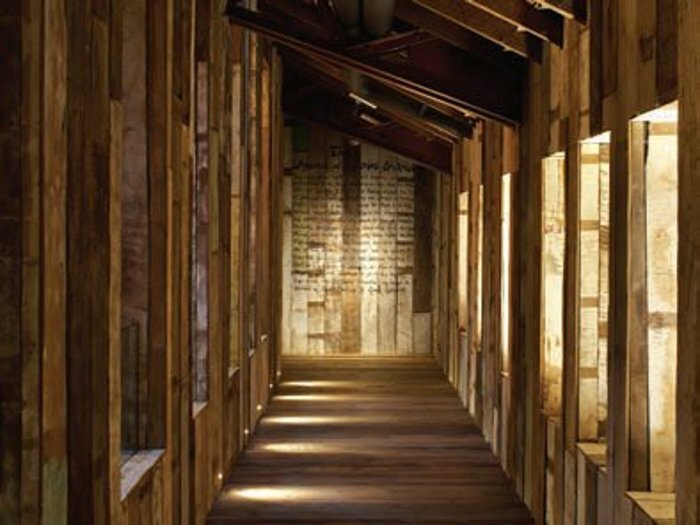 Weathered and battered, it set the tone for other reclaimed materials used throughout the scheme, such as wall panelling made from timber recycled from Balinese huts. 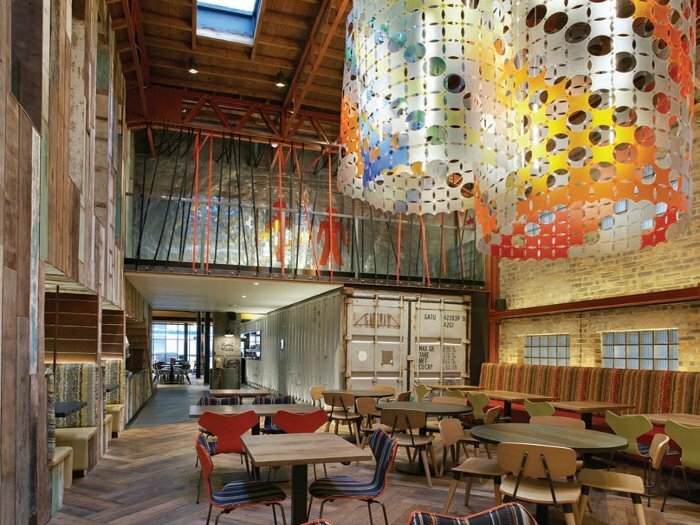 Much of the art in Nando's restaurants comes from an art foundation Nando's supports in South Africa. 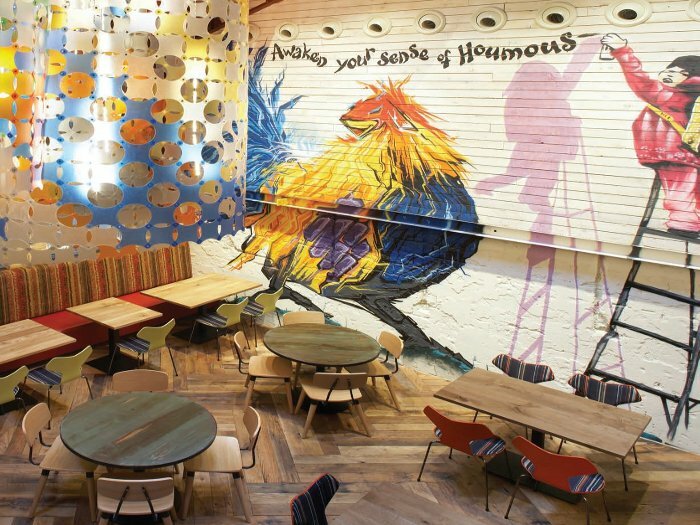 Dundee is no exception, but for the large back wall of the restaurant, Thrush decided to ask local artist Marc Delaye to create a graffiti-style mural based on the Nando's brand. Furniture too is beyond what you'd expect in a chain restaurant and includes classic Grand Prix chairs by Fritz Hansen, upholstered with Paul Smith fabric.